IgG is the most common disease isotype, followed by IgA, IgD, IgM and IgE. An abnormal κ/λ sFLC ratio is detected in around 95% of patients. Monitoring concentration changes in the intact immunoglobulin is essential for assessing patient response. An abnormal IgG or IgA Hevylite® ratio (corresponding to the monoclonal immunoglobulin type) is found in 97 - 100% of both IgG and IgA multiple myeloma patients at diagnosis. Hevylite assays offer an alternative method to densitometric quantification in cases where small monoclonal proteins are obscured by other serum proteins. Approximately 80% of all multiple myeloma (MM) patients produce monoclonal intact immunoglobulins, with 95% of these also producing monoclonal serum free light chains (sFLCs). IgG intact immunoglobulin multiple myeloma (IIMM) accounts for more than half of all MM patients, and IgA IIMM accounts for a further 20% of cases (Table 17.1) . Only around 1 - 2% of patients have IgD IIMM  and monoclonal IgM is present in less than 1% of MM patients  (more commonly found in Waldenström’s macroglobulinaemia, Chapter 32). IgE MM is extremely rare, with fewer than 50 cases reported in the literature . Around 1-2% of MM patients are diagnosed with biclonal gammopathy (Sections 7.7 and 17.2) . In such cases, two monoclonal proteins are identified that can differ in their heavy chains, light chains or both. It has been proposed that the larger (dominant) monoclonal protein is a product of the active MM clone(s), and the smaller (minor) monoclonal protein represents a separate benign MGUS-like clone (Chapter 13) . 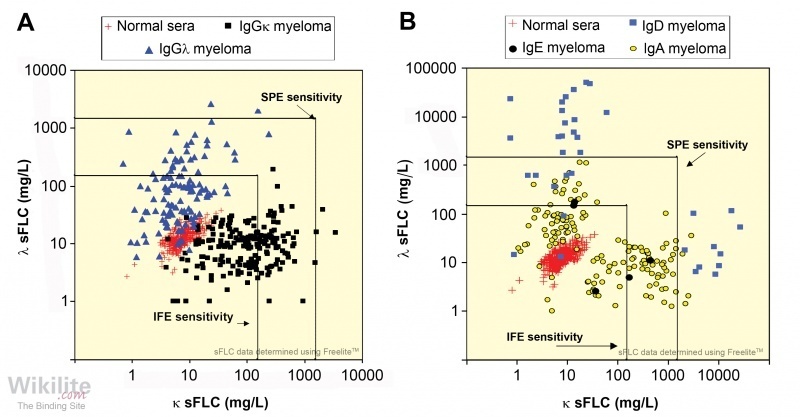 Measurements of the monoclonal intact immunoglobulin and sFLC are essential for diagnosis and follow-up of IIMM, and form the basis of response criteria . This chapter reviews intact immunoglobulin and sFLC measurements at diagnosis. The limitations of serum electrophoretic techniques used to quantify monoclonal intact immunoglobulins are discussed, along with heavy chain/light chain immunoglobulin (Hevylite, HLC) assays. Table 17.1. Types of serum monoclonal proteins in 1027 patients with multiple myeloma . *Total does not equal 100% due to rounding. Once a monoclonal intact immunoglobulin is identified in a patient's serum, guidelines recommend that it is quantified using scanning densitometry of serum protein electrophoresis (SPE) gels (or capillary zone electrophoresis [CZE]), alongside nephelometric/turbidimetric quantitation of total immunoglobulins (Chapter 25) . The serum concentration of the monoclonal intact immunoglobulin is an important determinant in choosing the correct method to monitor disease course. 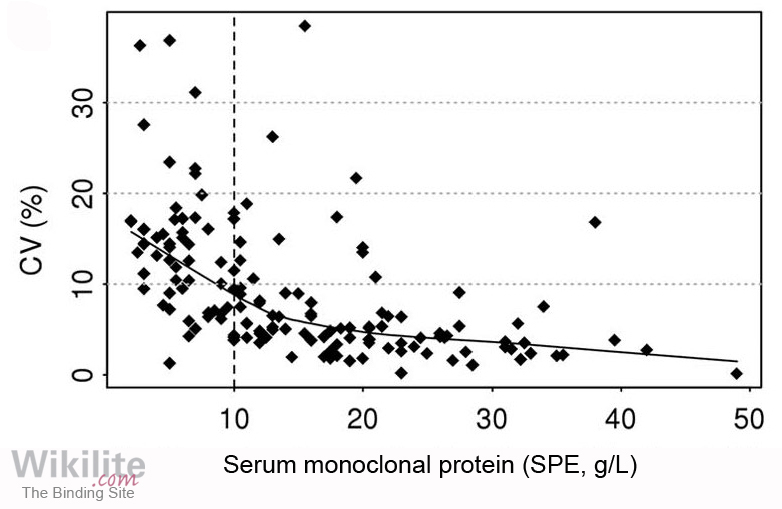 Whilst it is preferred that monoclonal proteins are monitored by densitometric quantification, in cases where small monoclonal proteins are obscured by other serum proteins (e.g. 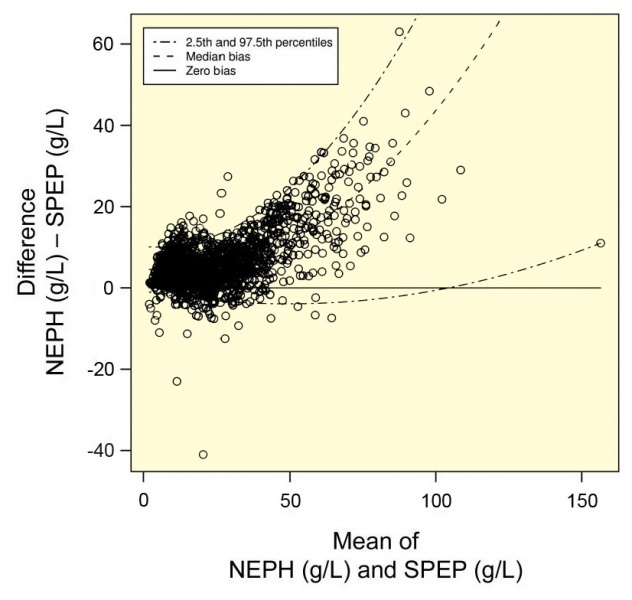 transferrin), nephelometric measurements may be more accurate . Additionally, international guidelines recommend performing sFLC analysis at presentation as it provides important prognostic information (Chapter 20). This also gives a baseline measurement for monitoring oligosecretory patients (serum monoclonal protein <10 g/L and urine monoclonal protein <200 mg/24 hours ) and all patients to allow early detection of relapse by FLC escape (Chapter 18) . HLC immunoassays provide an additional tool for the management of patients with IIMM. The assays separately quantify the different light chain types of each immunoglobulin isotype (i.e. IgGκ, IgGλ, IgAκ, IgAλ, IgMκ and IgMλ, Chapter 9). The molecules are assessed in pairs to produce HLC ratios (e.g. IgGκ/IgGλ) in the same manner as κ/λ sFLC ratios. The HLC ratio provides information on both the involved (monoclonal) immunoglobulin (e.g. IgGκ in an IgGκ patient) and the uninvolved (polyclonal) HLC-pair (e.g. IgGλ in an IgGκ patient). When the concentration of the HLC-pair is below the normal reference interval, alongside an abnormal HLC ratio, this is termed “HLC-pair suppression”. HLC assays are less labour-intensive and less subjective than serum electrophoretic techniques , and may overcome many of the known limitations of serum electrophoresis discussed above (including co-migration, dye saturation and broadly migrating monoclonal proteins, Section 17.4). 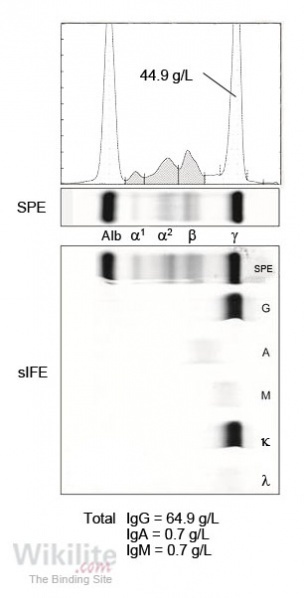 For example, in Figure 17.6 two cases are presented in which monoclonal proteins co-migrate with other serum proteins bands, whereas HLC assays provide a quantitative result . HLC assays were assessed in a large cohort of IIMM patients recruited to the IFM 2005-01 MM trial . A total of 339 patients, comprising 245 with IgG (166 IgGκ, 79 IgGλ) and 94 with IgA (60 IgAκ, 34 IgAλ) isotypes were evaluated at presentation. The HLC data are summarised in Figure 17.7A and B, using Ig’κ/Ig’λ dot plots. The involved HLC concentration was greater than the upper limit of the normal range in the majority of patients (Tables 17.3 and 17.4), and all IIMM patients had the corresponding abnormal HLC ratio. Thirty-three percent (31/94) of the IgA patients could not be accurately quantified by SPE, due to co-migration with other serum proteins. An initial study of IgM Hevylite in IgM MM concluded that HLC ratios were concordant with IFE results, and that HLC-pair suppression identified patients with inferior outcome (Section 20.5) . Table 17.3. 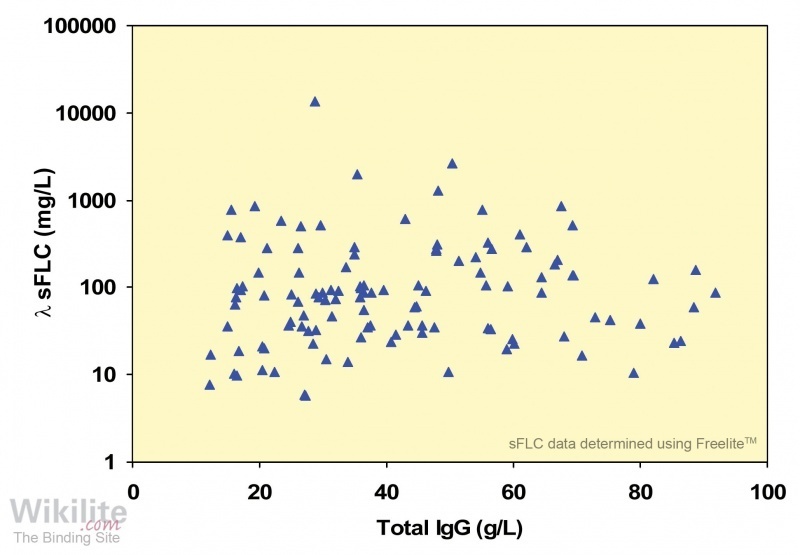 Concentrations of IgG monoclonal proteins and IgG HLC in 245 patients with IgG MM . Table 17.4. 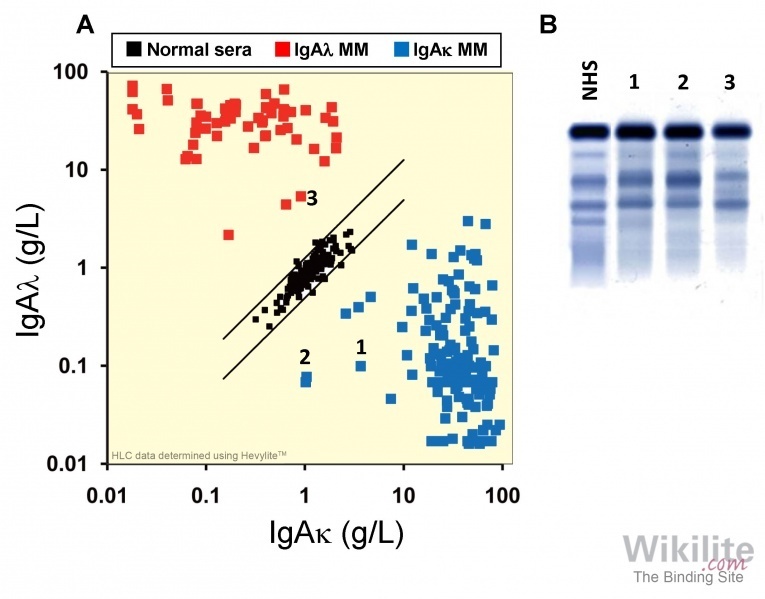 Concentrations of IgA monoclonal proteins and IgA HLC in 94 patients with IgA MM . Ludwig et al. evaluated the HLC assays in 100 IgG and 56 IgA MM patients, all of whom had corresponding abnormal HLC ratios at diagnosis. Of note, accurate quantitation of the monoclonal immunoglobulin by SPE densitometry was not possible in 46% (26/56) of IgA patients and 4% (4/100) of IgG patients due to co-migration with other serum proteins. Similarly, in a study by Mirbahai et al. comparing HLC data with SPE results at diagnosis of IgA MM all 210 patients had abnormal HLC ratios as determined by HLC assays (Figure 17.8A). However, accurate quantitation of the monoclonal protein was not possible in 40% (83/210) of patients by SPE; three of these are shown in Figure 17.8B. Katzmann et al. assessed the diagnostic sensitivity of HLC ratios in 365 IgG and 153 IgA MM patients at presentation. An abnormal HLC ratio was present in 97% of both IgG (354/365) and IgA (148/153) diagnostic samples. 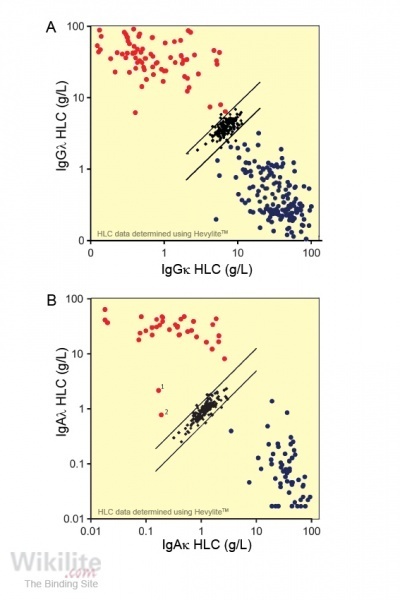 In IgA MM, the HLC ratio was more sensitive for detecting a monoclonal intact immunoglobulin than SPE (Section 4.2.5), and the authors recognised the utility of HLC assays in patients whose monoclonal protein migrates in the β-region. In the IFM 2005-01 MM trial , the majority of IIMM patients had HLC-pair suppression (i.e. reduced concentrations of IgGκ in a patient with IgGλ IIMM). For IgGκ, IgGλ, IgAκ and IgAλ MM patients HLC-pair suppression was present in 99%, 92%, 93% and 69% of cases, respectively. For the IFM-2009 trial, 93% of IIMM patients had HLC-pair suppression at diagnosis . Similar findings were reported by Ludwig et al. . For one IFM IgAλ patient whose IgAλ HLC concentration was within the normal range (labelled 2 in Figure 17.7B), IgAκ HLC-pair suppression was present and the IgAκ/IgAλ ratio was abnormal. Interestingly, this patient and one additional patient (labelled 1 in Figure 17.7B) had highly elevated λ sFLC concentrations (8,500 mg/L and 103,000 mg/L, respectively). This was consistent with monoclonal λ sFLCs being the dominant monoclonal protein produced by the tumour. In such cases, sFLC analysis may be more informative for monitoring disease status (Chapter 18). A number of studies have demonstrated that the degree of HLC-pair suppression varies greatly between patients (Tables 17.3 and 17.4) and during follow-up . For example, Michallet et al. reported a gradual increase of uHLC concentrations following stem cell transplantation and throughout consolidation, reaching a plateau during maintenance therapy. The IFM 2005-01 MM trial was the first to demonstrate that patients with higher concentrations of involved HLCs tended to have lower concentrations of uninvolved HLCs. This negative correlation between suppression and production was more significant in IgG patients (IgGκ: r = -0.456; p<0.0001; IgGλ: r = -0.310; p=0.005) than in IgA patients . Similar findings were reported by Ludwig et al. .
Ludwig et al. defined three categories of HLC-pair suppression: no suppression; moderate suppression (below the lower normal limit and up to 50% suppression), and severe suppression (a >50% reduction below the lower normal limit). Severe HLC-pair suppression was present in 54.5% (85/156) patients at diagnosis and tended to be more prevalent in IgG patients than IgA patients, but this did not reach statistical significance (57% vs 48.2%, p=0.0764). Several studies have reported an association of severe HLC-pair suppression with a significantly shorter survival  as well as an increased incidence of bloodstream infections , and is described in more detail in Section 20.4. How often are sFLC ratios abnormal in IIMM? 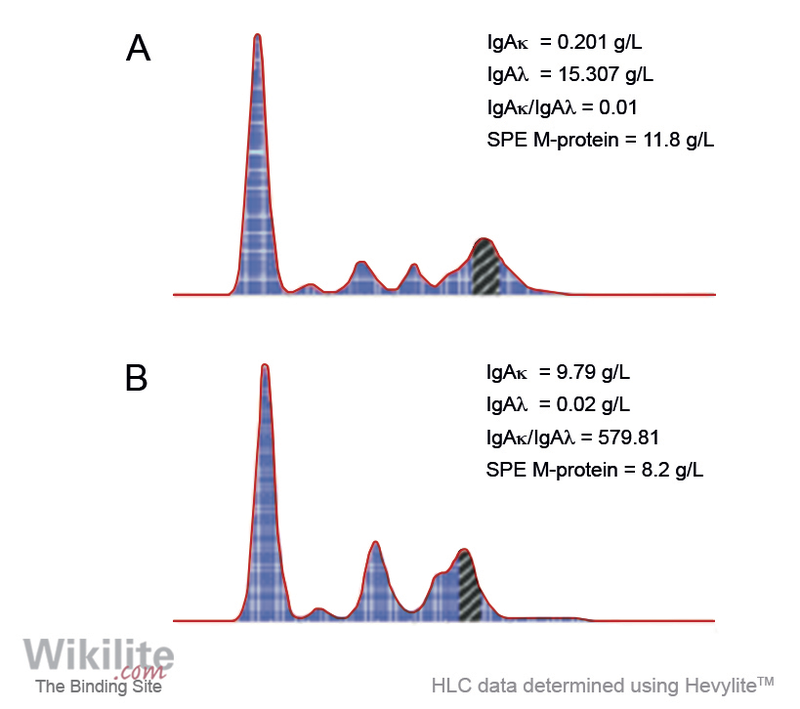 How frequently is quantitation of IgA monoclonal proteins not possible by SPE densitometry? How often are IgAκ/IgAλ HLC ratios abnormal in IgA MM patients at disease presentation? In approximately 95% of patients at clinical presentation (Section 17.2). Accurate quantitation by SPE is not possible in around 40% of IgA MM patients (Section 17.6). In 4 studies comprising 513 patients, IgAκ/IgAλ HLC ratios were abnormal in 99% of cases at clinical presentation (Section 17.6).